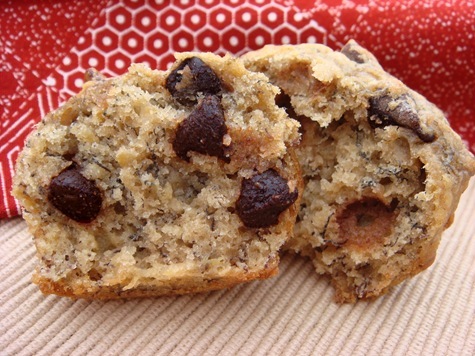 Looking for a banana muffin that is moist and full of banana flavor? This recipe (slightly adapted from Cook’s Illustrated) is your answer. It packs FIVE bananas into a single loaf of bread (or batch of 15-18 muffins). I like bananas, but only if they are on the slightly green side. Once they are completely yellow or start to brown, I won’t touch them. I can push them on the kids for a little longer, but none of us are squishy banana fans. So I regularly have one or two bananas from a bunch that go “bad” before we eat them. So I peel and throw these overripe bananas into my freezer in Ziploc bags. Eventually those bags get to the bursting point, and I know I need to do some banana baking. This recipe is one of our favorites. The bananas are cooked (in the microwave) until they are liquidy, and then the liquid is reduced to concentrate the banana flavor. You can add chocolate chips and/or chopped nuts to your liking. The muffins also freeze nicely if you happen to have A LOT of bananas to use up and want to make multiple batches! Preheat oven to 350°F. Line muffin tins with 15-18 paper liners, or grease muffin tins. Place bananas in a microwave-safe bowl; cover with waxed paper. Microwave on high power until bananas are soft and have released liquid, about 5 minutes. Pour bananas into a strainer placed over a medium saucepan. Allow to drain, stirring occasionally, for 15 minutes. Set banana pulp aside. Place the saucepan with the banana liquid over medium-high heat and cook until reduced to ¼ cup, about 5 minutes. Remove pan from heat and stir banana pulp into the reduced liquid. Mash with a potato masher or a fork until fairly smooth. Whisk in butter, eggs, brown sugar and vanilla. Pour banana mixture into flour mixture and stir until just combined. 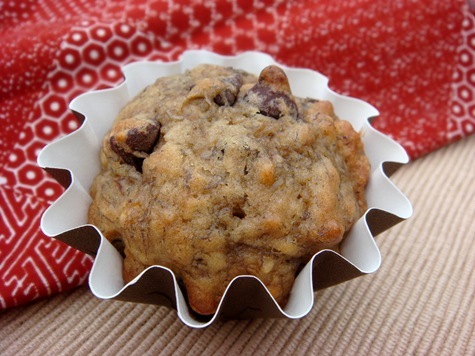 Gently fold in chocolate chips and walnuts, if using. Pour batter into the prepared muffin tins. Bake for 15 minutes, or until toothpick comes out clean. FOR BANANA BREAD: Spray a medium loaf pan with nonstick cooking spray. Pour batter into pan. Bake at 350°F for 55 to 70 minutes, or until toothpick comes out clean. Cool bread in pan on wire rack 15 minutes, then remove loaf from pan and continue to cool on a wire rack.